We have been acquainted with Shenks Ferry Wildflower Preserve for half a decade, and within this time we have come to understand qualities of our region that further deepen our sense of place; living here as we are under the same skies, we naturally gravitate to the earthly beings in our presence, and on this balmy April day, the green ones have our attention. Of course the blue waters of the grand Susquehanna River and the bluest of the crisp Spring Skies illuminating our world cannot be compared fairly to the transcendence of blue, iridescent pale blue of the Bluebells at Shenks Ferry. These gorgeous Springtime hillsides, filled with such a bountiful array of plants are the splendor of Spring in all of its glory on this balmy April day, they are a joy to behold and it is overwhelming, in the best way possible. 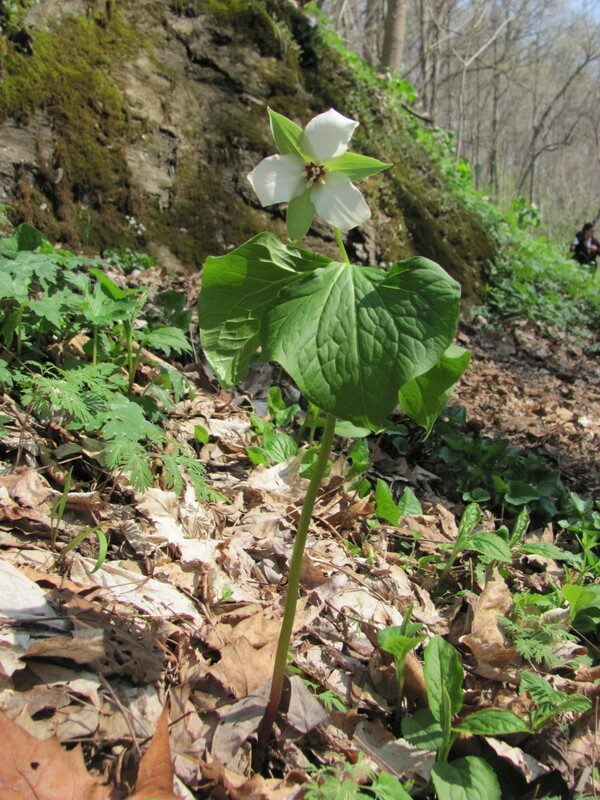 We begin identifying the plants in their scientific classifications, Latin names finding their ways off our tongues, establishing themselves clearly once again as if they have come out of dormancy, re-emerged from the earth itself having turned a brilliant green, white and blue- Mertensia, Aquilegia, Sanguinaria- canadensis, virginiana! But after a few hours here the classifications blur as much as the species of Trilliums in Shenks Ferry have hybridized and blurred into a white one now being called the Susquehanna Trillium –in any case we have lost our way, naturally into Spring we have become ensconsed; there is a beauty here we cannot articulate easily as we enjoy it. 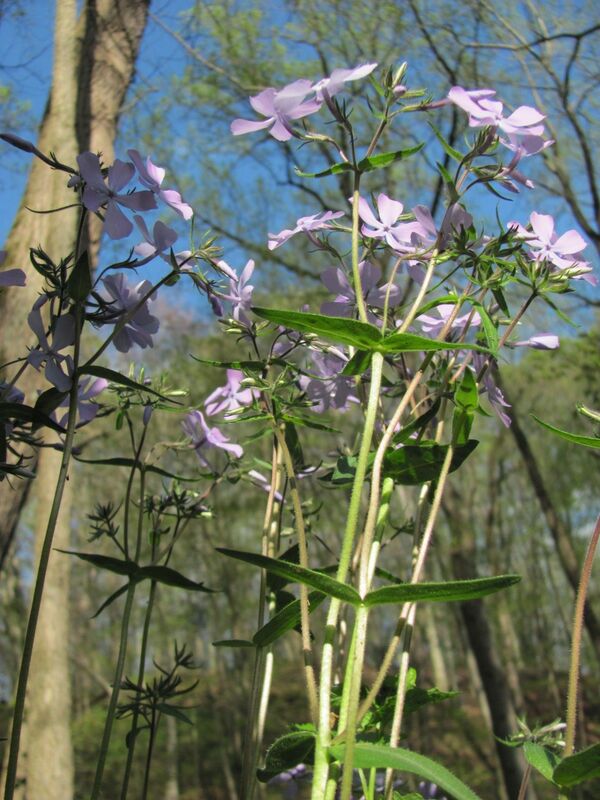 On this balmy Spring day at Shenks Ferry Wildflower Preserve. 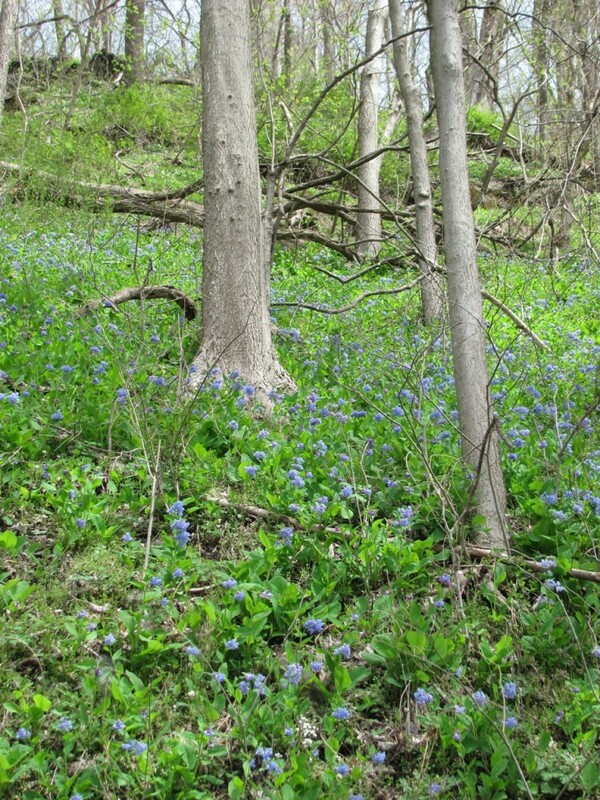 At once an emerging green hillside of Shenks Ferry is saturated with this effervescent blue color, bursting with the blue flowers, occurring in large patches across the hillside horizon and deep into the intersecting ravines abound with the whitest of Trillium blooms and the greenest of spring herbaceous foliage. 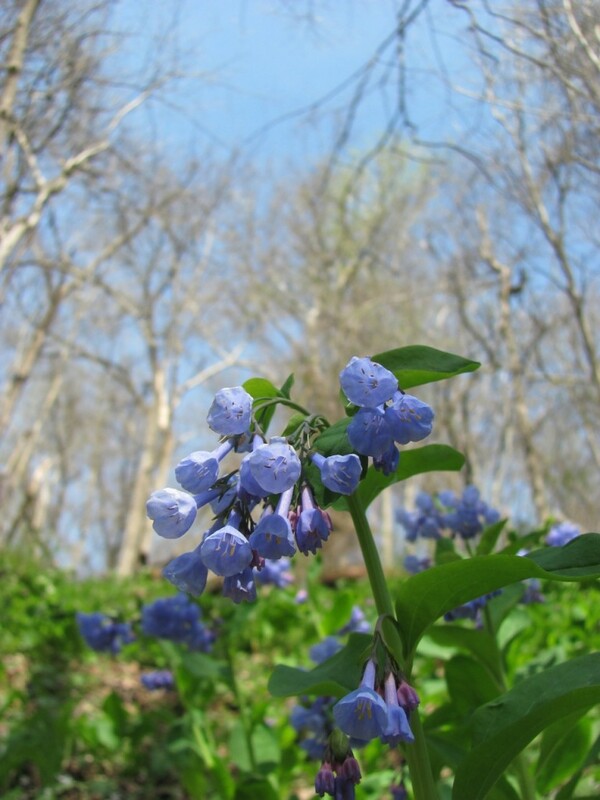 The hillsides have come alive with the most resonant colors, saturated with life, and upon closer inspection, rich and loaded with the subtleties of the color palette; blues found in a broad range of pigmentation in the species of Bluebells Mertensia virginica and within the Violets and Woodland Phlox-blues that have emerged from the Earth. 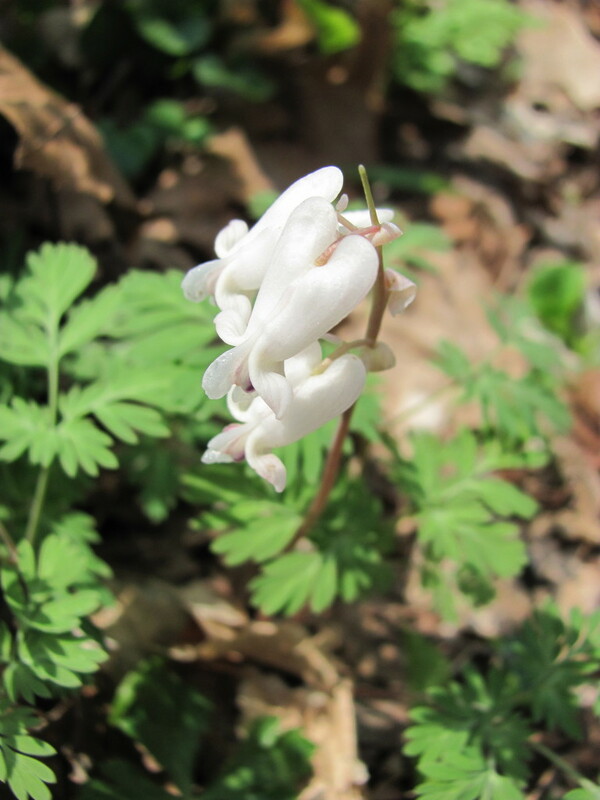 Below is the inflorescence of Squirrel Corn (Dicentra canadensis). 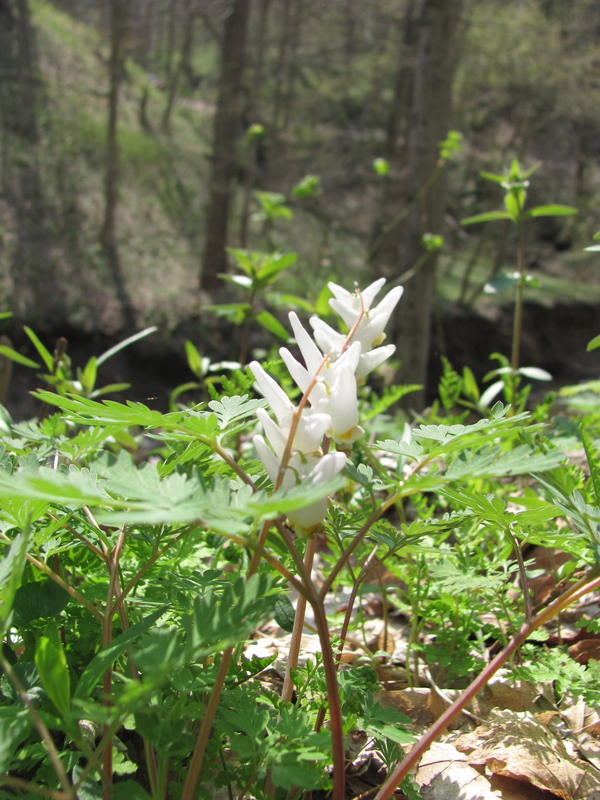 Above is the inflorescence of Dutchman’s Breeches (Dicentra cucullaria). Note the appearance of pantaloons hanging on a laundry line, the source of the common name. 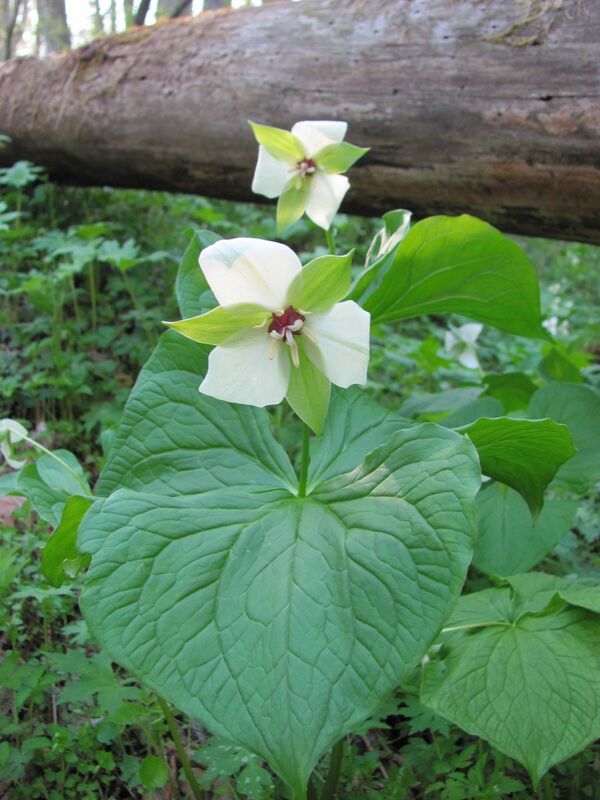 Bluebells and Trilliums, the iconic flowers of Shenks Ferry Wildflower Preserve. The wide trails at Shenks Ferry provide a great environment for wildflower appreciation and plenty of opportunity for socializing with other people also appreciating the beauty of this place. It is Spring when the excitement for the renewal of the landscape dominates insect, plant, human; plants- woody and herbaceous, become emotionally charged events in the human world; the insects, emerging from their states of hibernation buzz about the newly emerging flowering plants, hungry for the nectar. Shenks Ferry is a place that is just growing as it is- it is not there to directly feed us or provide any products that benefit us materially. When we leave we take nothing nor have we altered this place in any way-stepped on, trampled or crushed any plants, picked or eaten any. This is a place that we visit with the utmost respect of, a special place that we make no mark of our own upon, but one that we will come home never forgetting, always wanting to revisit. Just being there we have to remind ourselves that we are actually there, it is that special. We think about Shenks Ferry in the Springtime when we ponder the bigger picture-how we fit into the world as a species, our place amongst others, how we fit together and how much we like it- our true appreciation of our lives on this earth is contemplated-the best time to look at this aspect of life while stunned by the astounding beauty of this neighboring ravine of blooming plants. 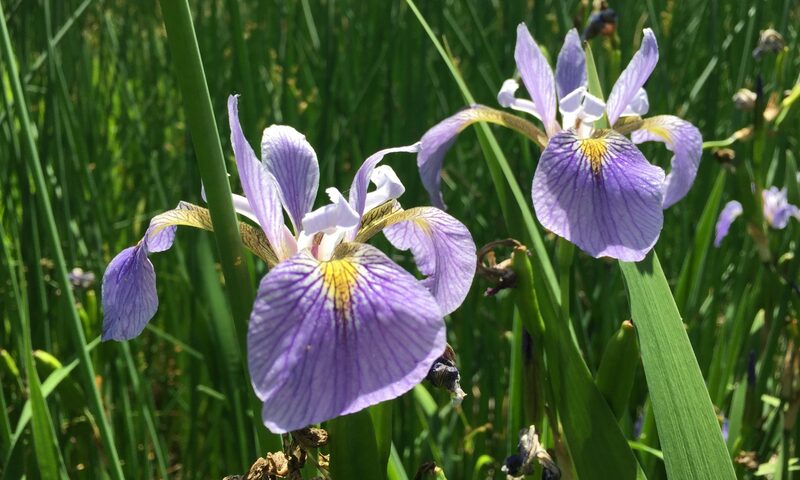 Here is a place of beauty and astounding botanical interest that we have not been aware of previously that has become part of our life routine every Spring. How lucky we are to encounter this earthen province! And with Shenks Ferry Wildflower Preserve we take with us a profound sense of natural beauty, regional beauty, a sense of place that is original and irreplaceable by anything, it is a true and visceral sensation of our place in the world; this is something coveted by all, that sense of place and belonging, this is something that concerns ourselves as we seek a continuation of the life we love. Nature and its obvious romanticized aura is often relied upon in the sentiments that surround the death of loved ones as well as the contemplations of our own ends. And precisely, why we bring up these beautiful spring flowers for you, here at Shenks Ferry, because they are about the lively life abounding before us, the continuous proliferation of species. When our species interacts with the land, often enough the distinction and charm of the region is lost, most likely in concurrence with the loss of habitat of existing species. The resulting extirpations deprive the land of its character and connection to its provenance and the other species have no recourse. Such disturbances are common enough, making it increasingly difficult for the impressionable imagination to comprehend the land as it had previously evolved. Geologically, such drastic changes are considered catastrophic and are often considered the end of a stage of time, a delineation that can be read in the fossils embedded in rocks, where species are suddenly cut off, often to become extinct. Geologists in some circles are even starting to discuss re-naming the era we live in today to reflect these drastic world-wide changes in the land that are supposedly reflecting the needs of our species. It is difficult to understand how altering the land to sustain the needs of our species often results in the extirpation of so many other species. While making no claims to define and romanticize a pristine ‘natural’ world, it must be said that the lands in our midst are being used in an inappropriate and inefficient manner and there are long-term consequences to such habitat loss and extirpation. Consider the pollination issue, one that is rising up steadily in our scientific understanding, and is directly threatening our food supply as a species. Everything we eat requires pollinating insects-such as our food also requires water and sunlight to grow. The pollinating insects buzz from plant to plant distributing the pollen of other plants to the plants we will be hopefully eating the fruits of. The fruits will not grow if they don’t receive the pollen from the other plants because every species requires genetic diversity within populations. No pollinating insects > less plants pollinated > less fruit > less food and so on. 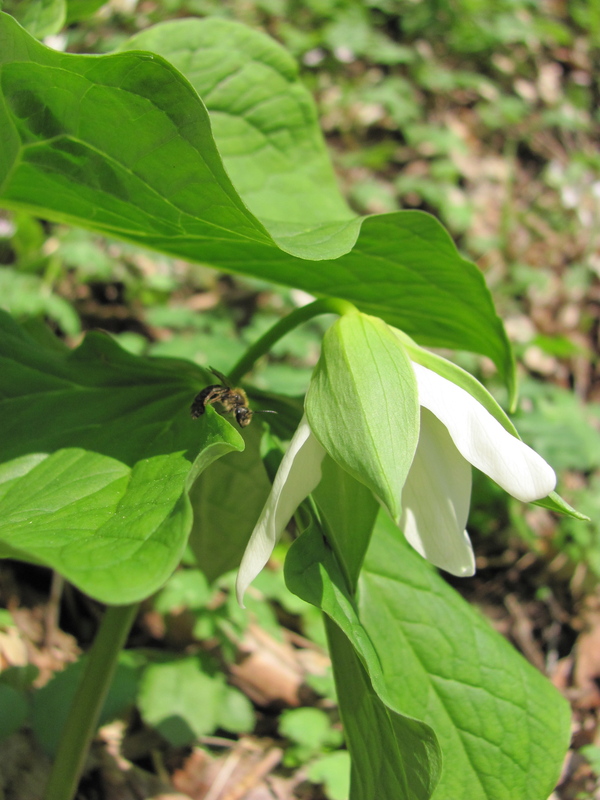 The introduction of the European honey-bee has been important to pollinating crops, and the sudden bee colony collapse syndrome has those in the agriculture industry, scientists and many others alarmed. With the steady decline of other types of bees, necessary habitats that sustain all pollinating insects, 9 billion humans who are concerned about eating in the long term should be very alarmed. 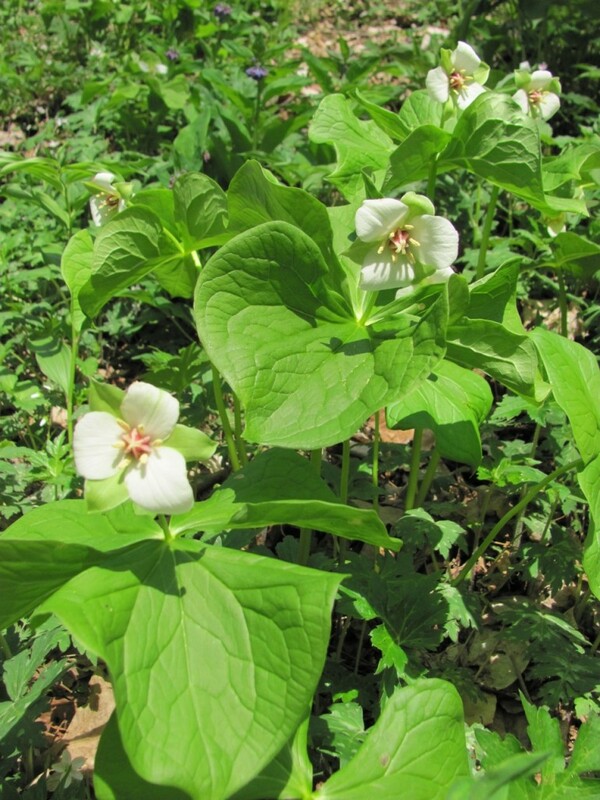 These plants we speak of blooming beautifully on this fine spring day in this small 50 acre forest remnant often play an important role in maintaining the habitat of the web of insects that literally keep us alive. 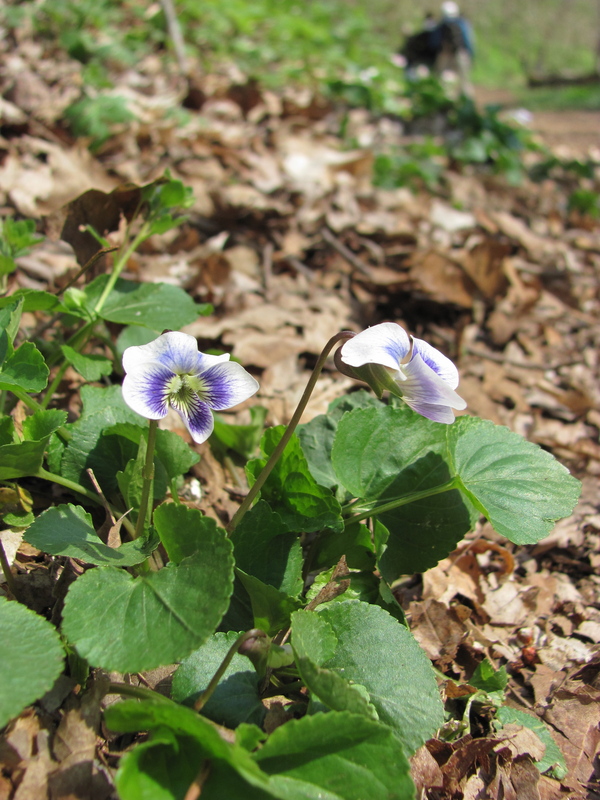 These plants are hosting these insects, many of them are the sole hosts of their species-specific larvae. For example, the Spicebush Swallowtail Butterfly pollinating your garden vegetables depends on the Spicebush in the woods. This is the species that it needs to reproduce. This is the plant where it lays its eggs. An so on with this we go delving into the ecosystems of species all around us that we as a species behave in ways that are interpreted to be oblivious to their outcomes, their health and ultimately to our own. Generally in our stewardship roles in environmental restoration go, if we don’t know what it is we do not remove it. We can only hope that in the forgotten niches, grottos and crevices of the lands humans use and alter, species of plants, insects, birds, mosses etc will survive and weather the onslaught of short-sighted and negligent practices of land use. Natural areas such as Shenk Ferry Wildflower Preserve continue to be dissected and carved up as the immediate needs of society demand wiring races of high-tension lines and the plumbing of oil and gas; yes indeed as we arrived at the front gate it was immediately brought to our attention that there is a proposed gas pipe-line to run right through Shenks Ferry Wildflower Preserve, with a 150 foot wide open cut. We were unable to get the exact details of this horrifying proposition, but it could greatly diminish the preserve and may even threaten rare species, ruin a natural treasure of Lancaster County and generally destroy the quality of life of all of those around the locally extirpated species. This shocking news left us looking at flowers that are now being threatened and may not exist if this monstrosity is plumbed through this tiny, fragile preserve. There are calls for public comment and addressing legislators. Please visit The Lancaster Conservancy’s site to get more information. 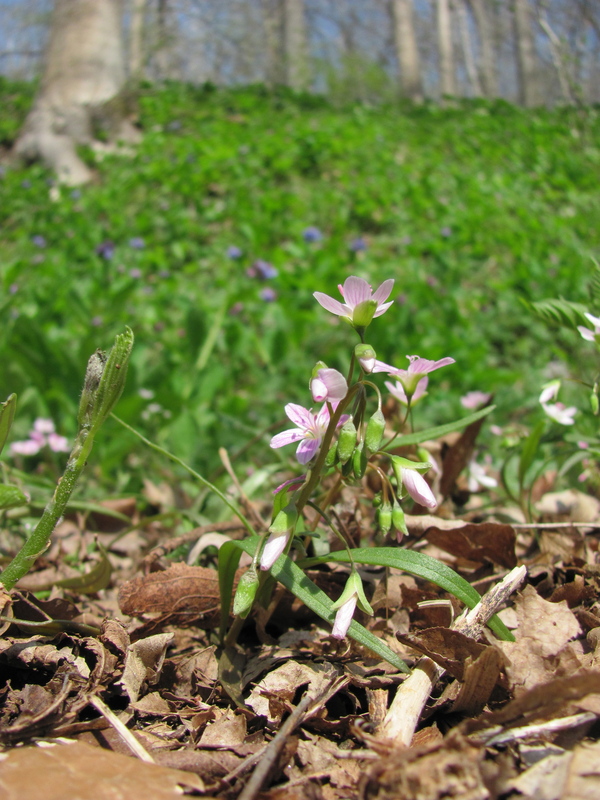 As ephemeral as some of the springtime wildflowers are, the land we reside in can be blooming one day and gone the next. While recovery is possible, as some species survive and exist in the hidden cracks of the human landscape, much is lost in the persistent dis-mantling of ecosystems and habitats. The elusive, long-term costs to such environmental devastation can be speculated, assessed, hypothesized, dramatized, overlooked, ignored and addressed, but they are most certainly not known. As quickly as the spring wildflowers drop to the ground into dormancy, to return the following year, as they have for millennia, often in the same spot or ones nearby, new seasons are ahead and they fade from memory until they re-emerge from the earth. These are the cycles of life we have adapted to in our cultures, the death/ renewal rituals often accompanied by the plants and flowers, animals- the world around us that gives us meaning to life, and a sense of place. The sense of meaning to life that makes it worthwhile, to continue on, to exist in this form and condition in this place is something that is held on to and interpreted and reinterpreted, but remains established. Is there something missing in the realm of meaningful thought , ritual, collective philosophical agreement, historical congruity (that which has translated across historical periods and civilizations resulting in collective assumptions and behaviors), the understanding of our world and ritual that is resulting in this outright disregard for other species, habitats, places? Please chime in with your thoughts on this question. If the level of desperation for resources is that acute that long term planning of our own specie’s survival is lacking and premature, then perhaps the sense of meaning and purpose that drives our cultures and society is failing us and that needs to be addressed before our species can begin to at least respect the rest of the world around us. Perhaps a starting place to re-evaluate on a species level our place in the universe would be to carefully and sensitively look at what we are destroying first, and go from there. If we as a species are unable to evolve and adapt to living amidst the other ones and their (our) habitats and ecosystems, include this adaptation into our daily cosmology, ritualize our evolutionary processes in practice and philosophy, we will ultimately fail, delegitimizing all of this species’ constructions- spiritual, cultural, metaphysical and otherwise in the geological record. One last thought as our precious wildflower preserve is threatened with further destruction: We as a species will lose out the most, being deprived of the landscapes that give us a sense of being, perspective-giving vistas, seasonally changing and appropriate back-rounds to our lives, the places we take our families to see are being taken away from us, one gas pipeline at a time. Whole populations of trees, shrubs, and herbaceous plants, animal habitats, insects will be extirpated in this proposed pipeline. In other words, they will be ripped out and will die. Our wildflower preserve will die in so many ways congruently. At best and hopefully, the species of concern will survive this latest assault and will eventually recover and may indeed repopulate this place and we may or may not be here to appreciate this in the unknown future of Shenks Ferry. Regardless of this outcome, which may result in destruction and lifetime extirpations and the long term destruction of habitat and ruination, further degrading our quality of life, there may be a glimmer of light long in the future- the species of Shenks Ferry will possibly survive this one, as they have for millennia and one day thrive as beautifully as they do on this fine, balmy, April 19th Day, 2014. Or least perhaps one day a world will exist here that matches the beauty we as humans today perceive, value and recognize. 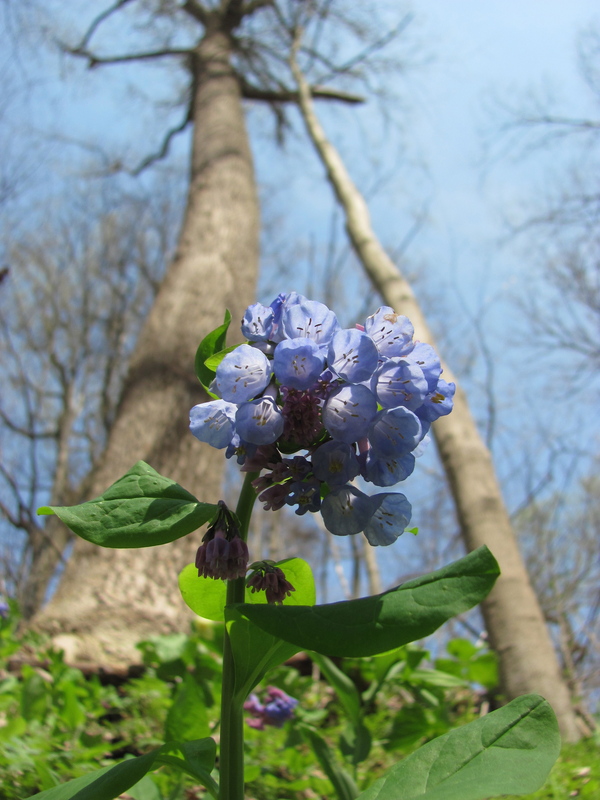 The Virginia Bluebell, Mertensia virginica, at Shenks Ferry Wildflower Preserve, as fresh and blue as can be! Winters are so much longer than Spring, so we are looking for ways to prolong Spring, to extend it somehow, so we can appreciate all of the changes, each one at a time, flower by flower, and every bright blue day and every rainshower! 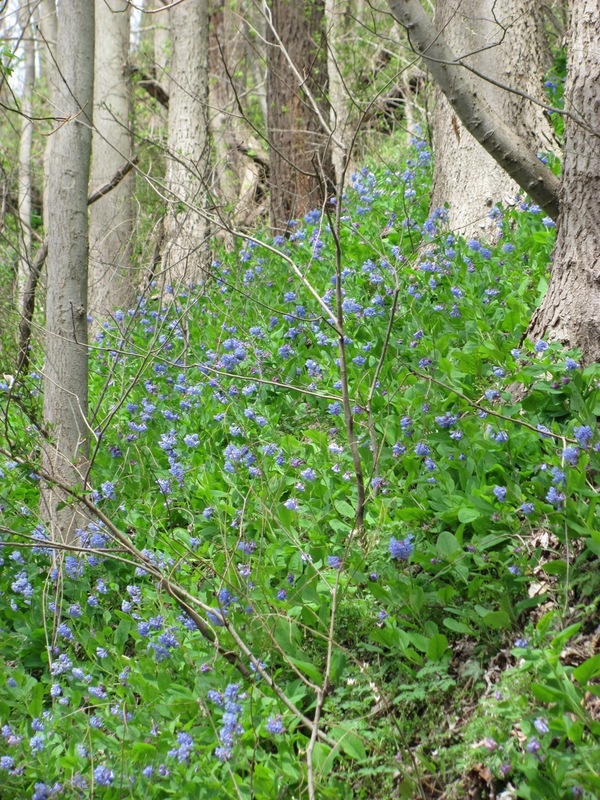 The Virginia Bluebells on the hillside, in the Susquehanna afternoon. 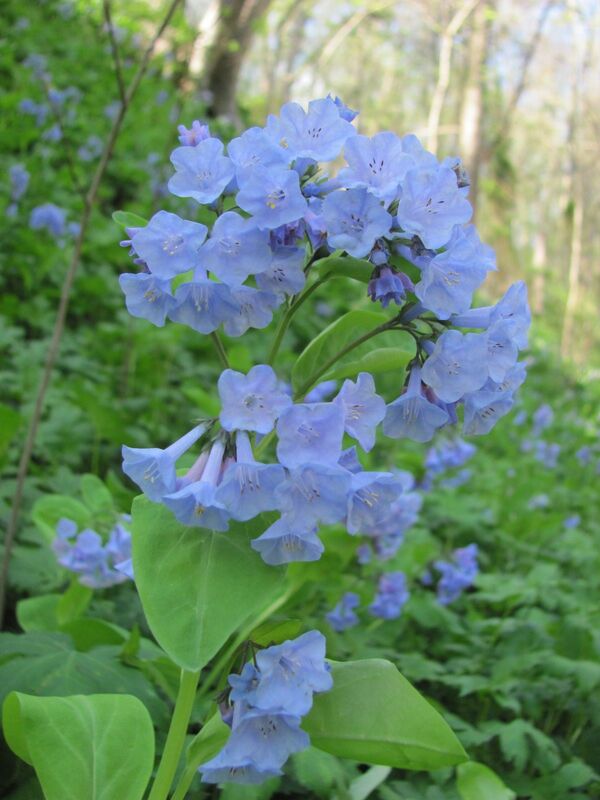 We found the bluebells growing in massive quantities on the Susquehanna floodplain, along with the white variety and the pink varieties, all naturally occurring. 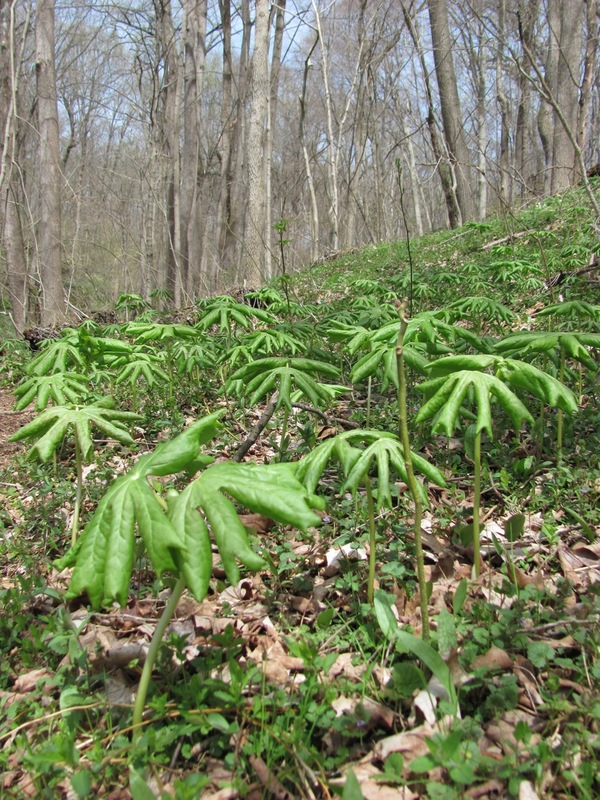 We found Virginia bluebells growing alongside Mayapples and Spring Beauties, Dutchman’s Breeches and of course Trilliums. 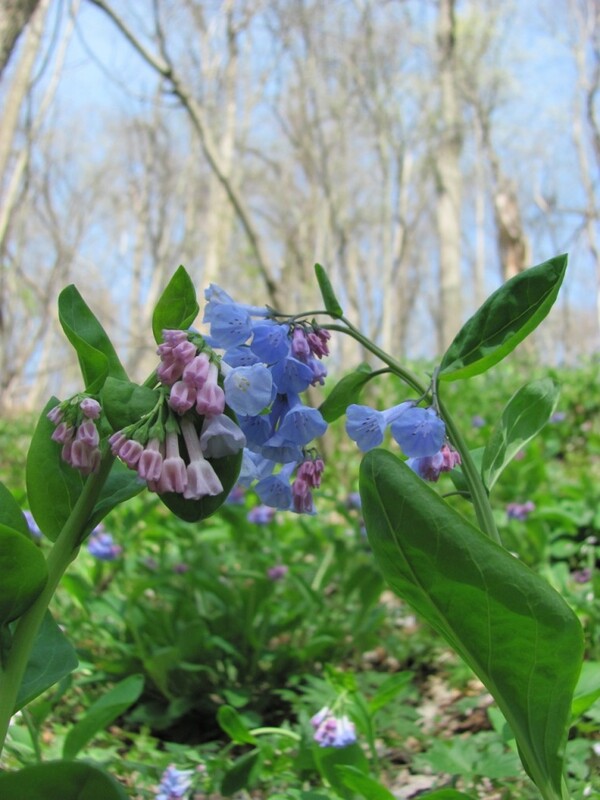 We found them blooming along the Schuylkill and the Delaware, and blooming in our own back and front yards, where we planted them, and now they are spreading and re-seeding themselves, covering once barren ground, damaged by invasives and disturbances, these cultivated Bluebells are now creating Spring, and extending it across the weary and torn urban soil. We come to Shenks Ferry and we are reminded of our own yards full of Bluebells, how hard we have worked to repair the degraded gardens and restore them to a state of natural beauty. We gain confirmation of the conditions of natural beauty in a place like Shenks Ferry. These are conditions we want to have more of in our lives, close to us as the garden is, because natural beauty does not have to be something that is visited upon, when it can so easily be lived in, even in cities. 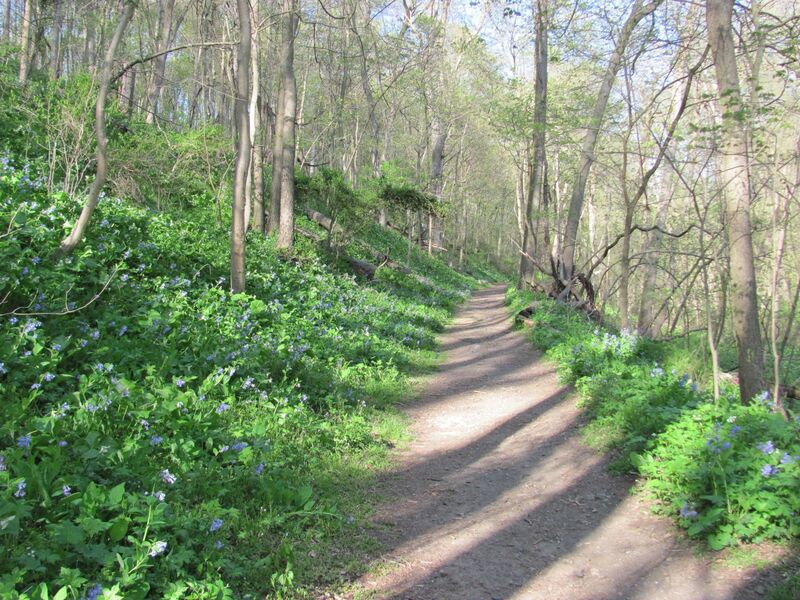 An inviting path through Spring itself- a walk into Shenks Ferry Wildflower Preserve. It is perhaps especially in cities that the natural world can not only be preserved, but maintained- preserved by neglect to some degree, where agricultural practices have ceased in favor of development, leaving fragments of land untouched altogether-and maintained by urban dwellers aware of the needs of a natural area and eager to volunteer their efforts at upholding it. The suburban model of land use is antithetical to natural lands conservation. Vast portions of land are dedicated to lawns. In effect, the suburbs use up much more natural lands than do cities per person. Housing development is consuming more and more land by the day. Maintaining these lawns requires fuel resources that require more destruction to the environment. These lawns do not contribute to the natural ecology of the region and if homeowners do not maintain them, often they can be fined! Driving to Shenks Ferry Wildflower Preserve we pass miles upon miles of mowed lawns and monolithic agriculture and the unmanaged lands we pass are just dense with invasive vines and weeds. Arriving at Shenks Ferry Wildflower Preserve is so pleasant and inviting. It has that Home aspect to it, as if we are at a place we can relax and enjoy the beauty of the flowers, the walk and the views. It is really neat to see all of the same plants we have in our Philadelphia gardens, growing in a natural setting. This woodland Phlox was in peak bloom at Shenks Ferry, lining both sides of the path, up and down the hillsides. Above, the whole plant, from the ground level. What has become very clear in our travels throughout the region in the past few years, in combination with our restoration efforts in Morris Park and our gardening adventures (most importantly), is that the beauty of a wildflower preserve can be re-created in our yards in a simple, easy way with no complications. In fact, the pictures in the above photographs, for the most part, could have been taken in our Philadelphia rowhouse back yards, because we have have planted and cultivated the same wildflowers. 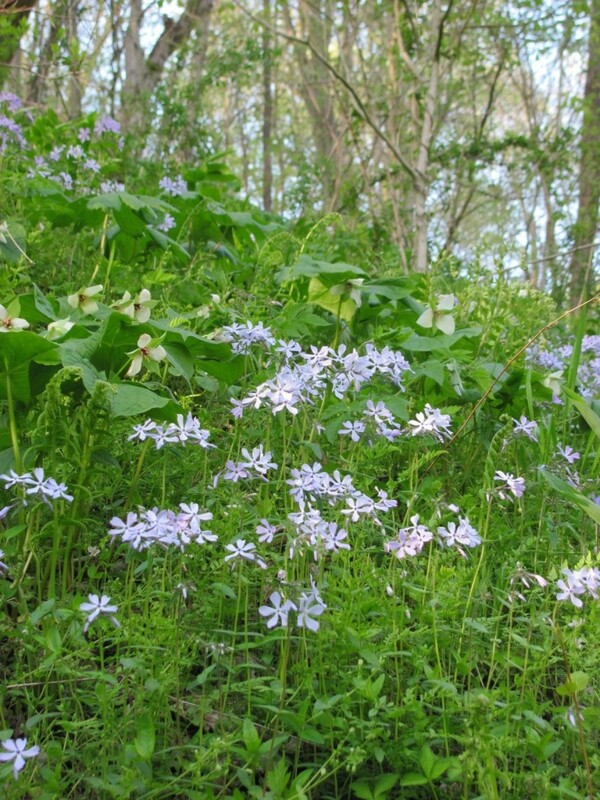 We have been able to bring this enchanting springtime forest of blooming wildflowers home to our yards. We were able to purchase these plants at the local native plant nursery, and the numerous plant sales that happen every spring. Like-minded friends with native plant gardens have also been generous with us, sharing their plants. From lawn to garden, the richness and beauty that this transformation culminates into when the birds come with their sweet springtime songs and bright colors as they feed upon and inhabit the garden is completed. This beauty is made from your hand that sculpts the rich garden from the desolate lawn. These exquisite songbirds that grace our soundscape in the early morning are completely dependent on the plants that grow in Shenks Ferry wildflower preserve- a stunning array of plants, trees and shrubs, all of them indigenous to the region, ecologically relevant and biologically connected to an ecosystem of thousands of species of plants and insects, all of them having co-existed here for millennia. What a better place for the songbirds to rely upon for their life’s sustenance than the place their species has been going to for millennia. 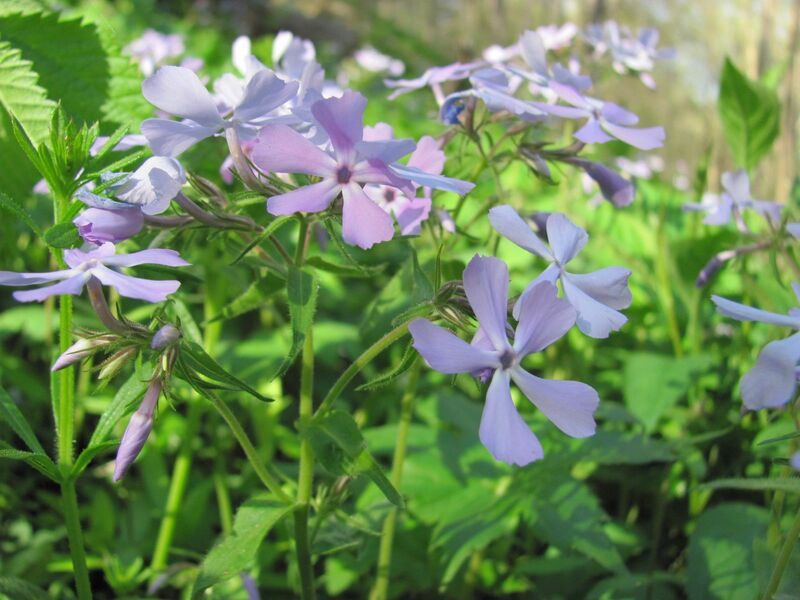 They are also potentially dependent on plants that you may have in your garden! It is now possible to quantify which plants host certain species and which do not, and this creates a system of ranking, where certain plants may be nearly useless to their contribution to a habitat and some may be even harmful, and many being very productive, interacting with and sustaining many species of insects and the songbirds that rely upon those insects, for one example. 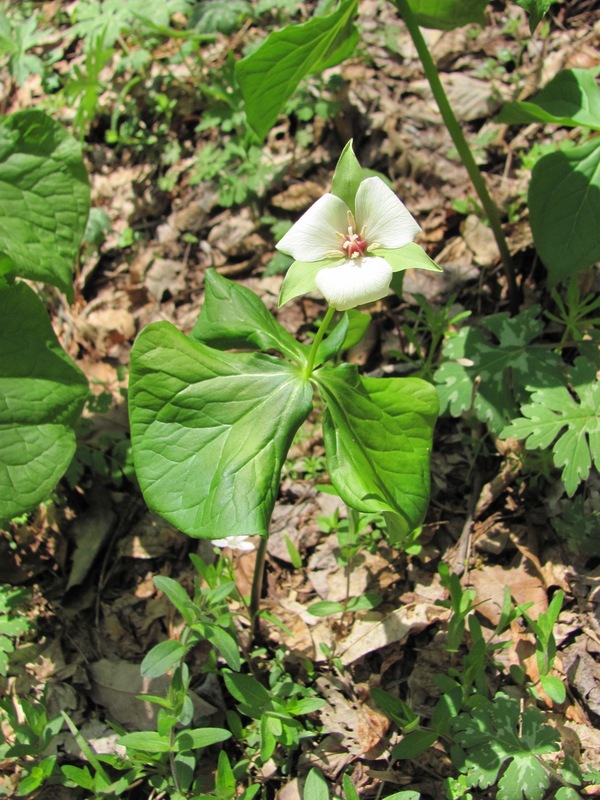 As it turns out the plants that do the most harm or are nearly useless are from other continents and have evolved in an ecosystem with non-relevant species than the one they were recently introduced to. What happened to the birds who relied upon the area of a suburban development that bulldozed the ecosystem and built houses with lawns? 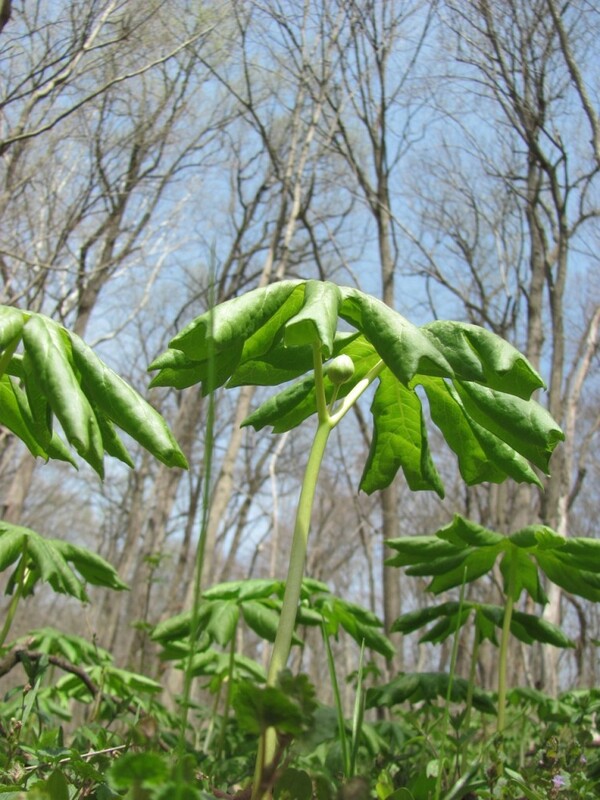 As with all of the plants, possibly birds also experienced something called extirpation. Extirpation is something like extinction in that it means that a specific area of land or a region has experienced a loss of a species. For any given area, an extirpation is very close to extinction. For a species to return to that area, the conditions would have to return to a former state, and hopefully that species extirpated would still be around to re-inhabit that area. This can happen and it has. However, often an area that has experienced an extirpation needs to be restored to a state that can support the extirpated species, which will return as soon as it can. This is where we come in, we humans, gardeners, lovers of nature, wondering what we can do to help out, possibly questioning the lawns, thinking about ecological sustainability, loving songbirds, flowers, springtime, wishing we could be at Shenks Ferry Wildflower Preserve! We can do it! Humans have created the conditions that have resulted in extirpations of species, we can also be the agents of change in the restoration. 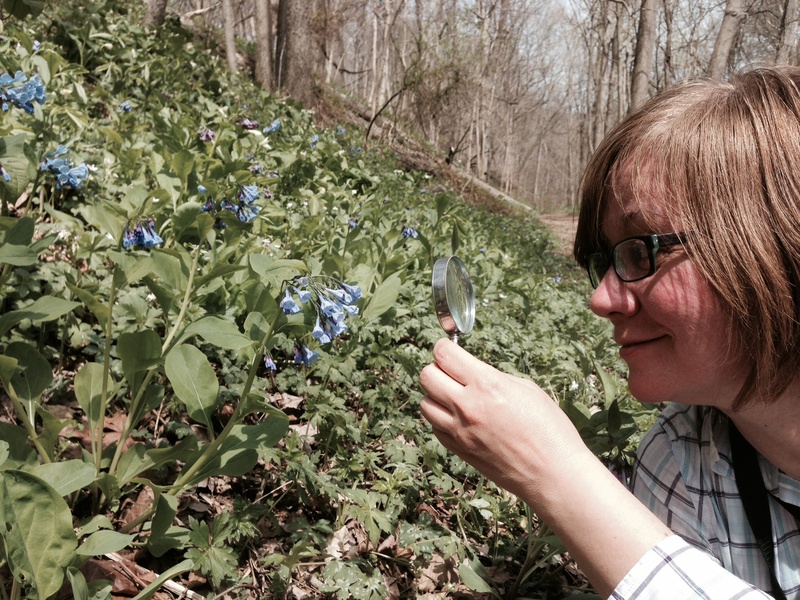 At Shenks Ferry, we can see the great variety of plant species before our eyes. Extirpation is often granted status at the state level, such as the species that have been extirpated from New Jersey. 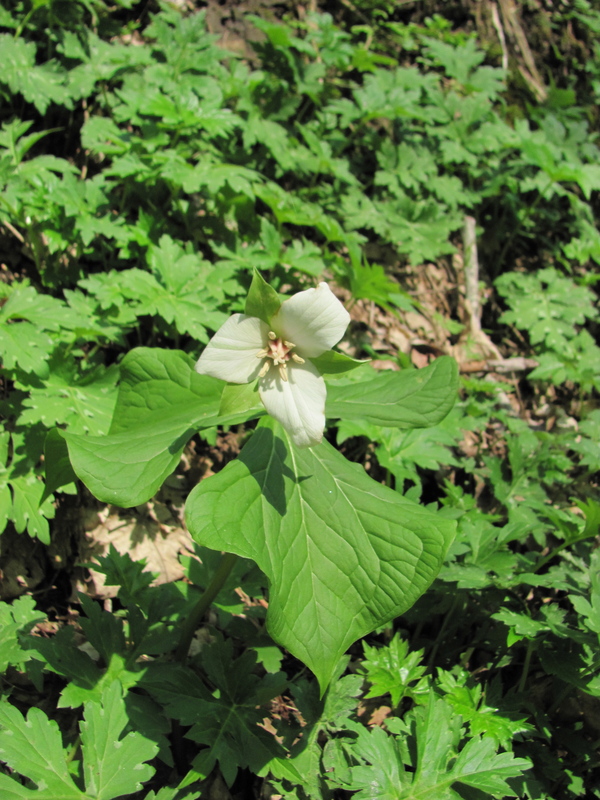 Considering that states have many sizes and can cover multiple ecological regions, it could be beneficial to the understanding of this process to view it on a smaller scale, especially if an extirpation truly occurs in a county, township, small park or natural area or a specific piece of private property, these need to be measured and given status. 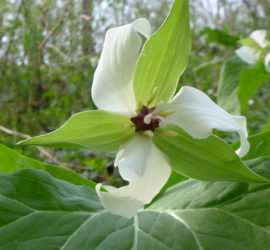 Consider Morris Park, Philadelphia, where sections of the park have been infested with invasives for a long enough time to crowd out the native flora, to the point that these plants no longer grow in the area they used to. These plants were locally extirpated from their ecosystem. 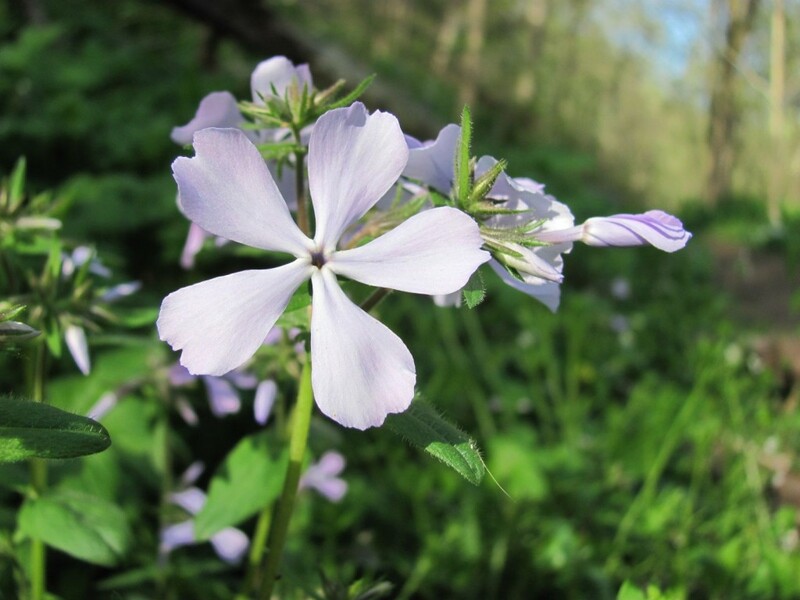 By removing the invasives in these areas, we have witnessed the self re-introduction of native species of plants, which now thrive in these formerly uninhabitable areas. Species such as Spicebush, the sole breeding-ground plant for the Spicebush Swallowtail butterfly, which now grows where it did not before. This is where our garden and perhaps your garden comes in: after we cleared away the invasives in the garden and planted Lonicera sempervirens, the native red-blooming honeysuckle, which does grow in Morris Park, just next door, the Ruby Throated hummingbird began to visit our garden for the first time in our recollection! We now have planted the native scarlet-red blooming Lobelia cardinalis, the Red Lobelia or Cardinal Flower, and the spring ephemeral, Red Columbine Aquilegia canadensis, as well as Bee Balm, Monarda didyma, and we have encouraged the tubular, red-flowered Campsis radicans vine to grow on a large brick garden wall that was crowded with the invasive Porcelain berry. Except for the invasive exotic Porcelain berry vine, These are all plants the hummingbirds need for their survival. We have witnessed the Hummingbirds visit these plants in our yards numerous times. Where before we had these plants there were no birds and now there are these Hummingbirds, we can only surmise that we have reversed the extirpation of this species in our own backyard. 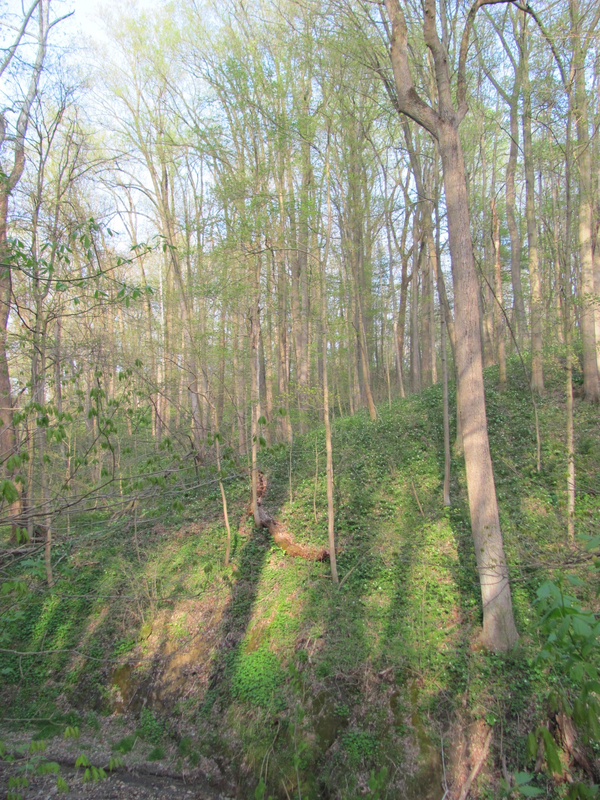 That and the Black Oaks, Tulip Poplars, Bloodroot, spicebush and the spicebush swallowtail butterflies that are now living in the area of the Park that was nothing but the invasives Multi-flora rose and Garlic mustard! 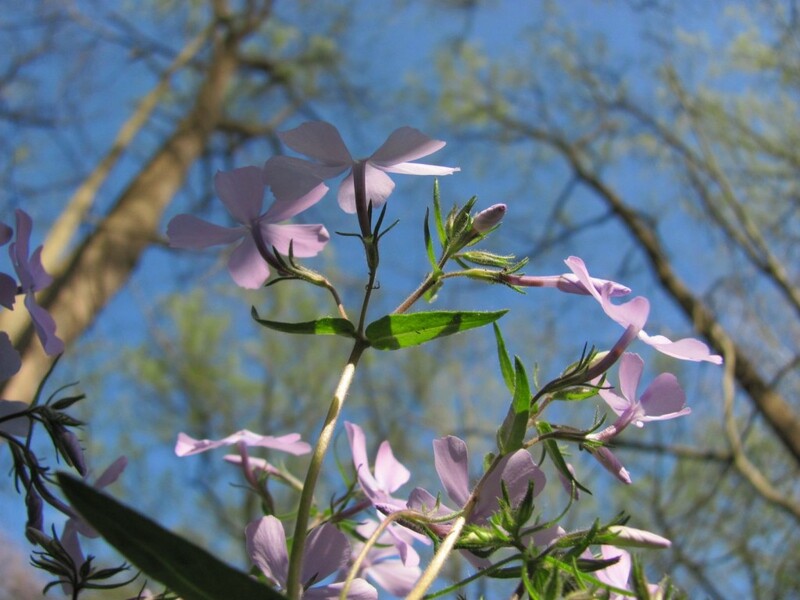 The sun has begun to set in the beautiful Lower Susquehanna Valley, and we have chosen Shenks Ferry Wildflower preserve as the location to enjoy the golden light of Spring. 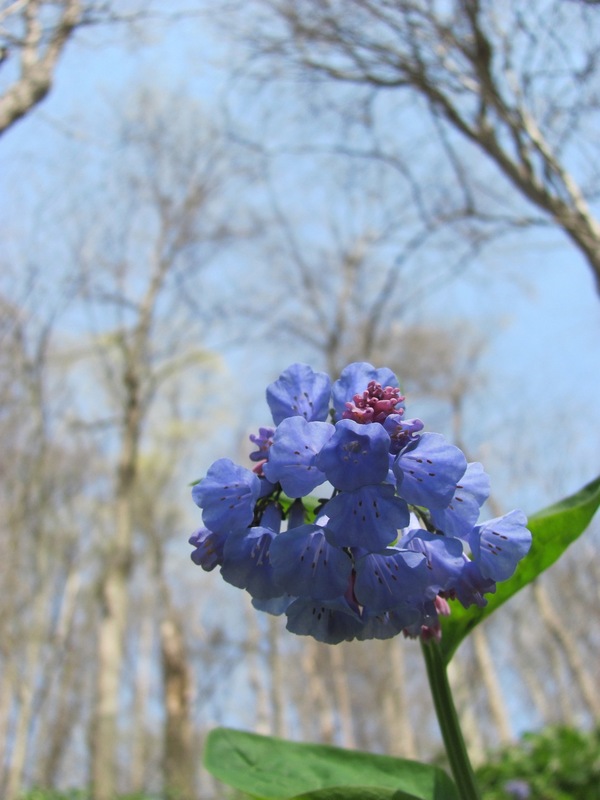 Hillsides covered with blooming spring flowers and the canopy of trees green with the promise of a lush summer ahead, it is very quiet except for the sweet sounds of a few songbirds. 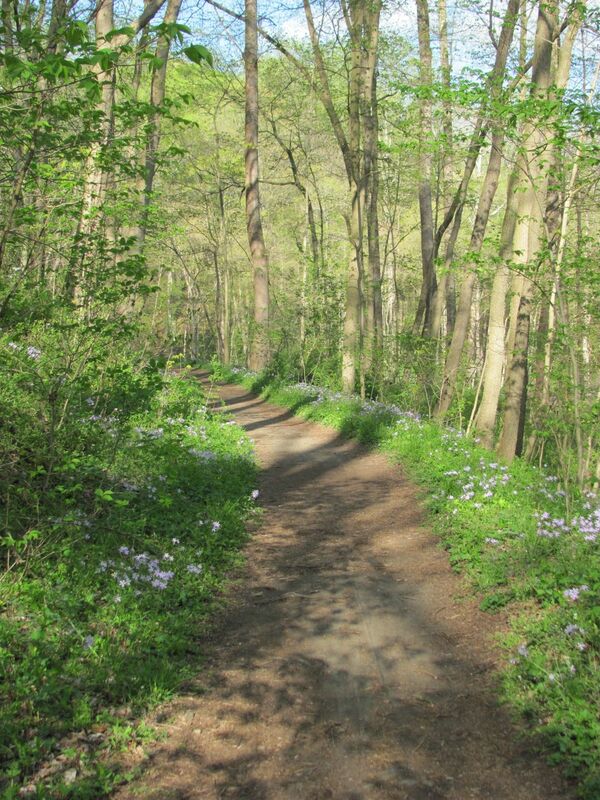 The path through Shenks Ferry is enchanting in the Springtime early evening.